Last chance for a gin and tonic with my friends FotoMarathonMan and AkhalTekeGal before they depart for their annual summer soaking and cooling in Yorkshire. We had fixed the date weeks ago and hoped that the weather would be good enough to try out the roof top bar at the Ritz Carlton. It is the only open air roof top bar on Vienna’s Ring. The Atmosphere roof top bar offers a small list of cocktails. This month’s specials are vodka infusions served in a copper teapot. But it was gin we were after. The house Gin Chiller is a cocktail based on Tanqueray 10, Fentimans tonic and a secret mix of herbal something or other added. The rest of the gin offering is the standard Tanqueray, Bombay Sapphire, Monkey 47, Hendricks, Beefeater list. Perfectly acceptable, but far from thrilling in these times of gin being “in.” The Gin Chiller is delicious and refreshing and contains a generous amount of the citrussy 10; a slice of blush (that’s pink) grapefruit and a golf ball sized ice sphere fill the glass. The little bottle of Fentiman’s tonic is served at the side. You can sit for a long time just adding a drop more tonic as the ice melts and dilutes the gin into a summery long drink. The drinks were served with a little bowl of salty nibbles and there is a small menu offering bar snacks. Prices are in the normal 5 star hotel range. We were greeted by a friendly young Dutch lady who offered us a choice of tables in the sun or in the shade. Another young Dutch lady came to take our order. They wore uniform white sunglasses. Our drinks were delivered by a young man. All the staff at rooftop bar seemed to be quite young and enthusiastic, but to be honest, they lacked the attentiveness and attention to detail that I expect of a Ritz Carlton. I have had amazing service there in the past, so that experience will not stop me from going back there for a proper cup of tea, or so. The roof top is very comfortably furnished and offers a mixture of table space, bar stools and lounge areas. There are fleece blankets and comfy cushions. 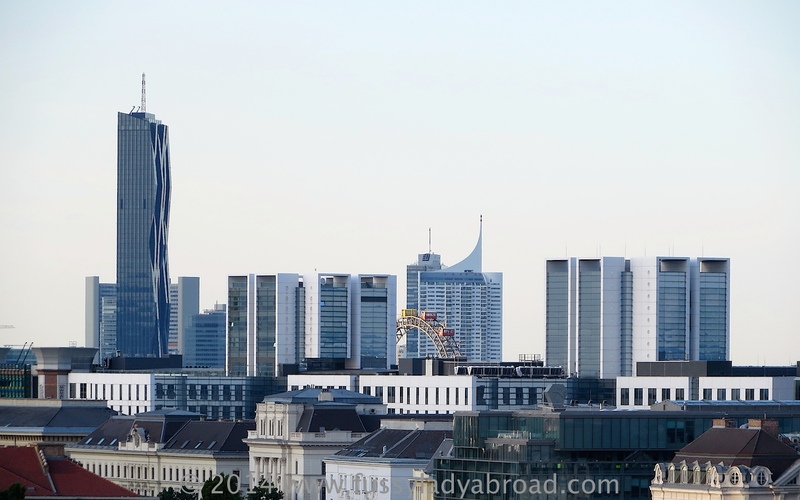 The views over the city are not spectacular as it is only on the 8th floor, but you can still see a fair amount, including Vienna’s landmark ferris wheel hiding amongst the high rise blocks of the controversial skyline project. We found the usual mixture of hotel guests, business people and locals, but none of the caricatures of European bourgeoisie that one finds in the lobby area of these grand hotels. So, if people watching is your thing, I’d stick to those areas of the hotel that are more easily accessed from the street by the mad. 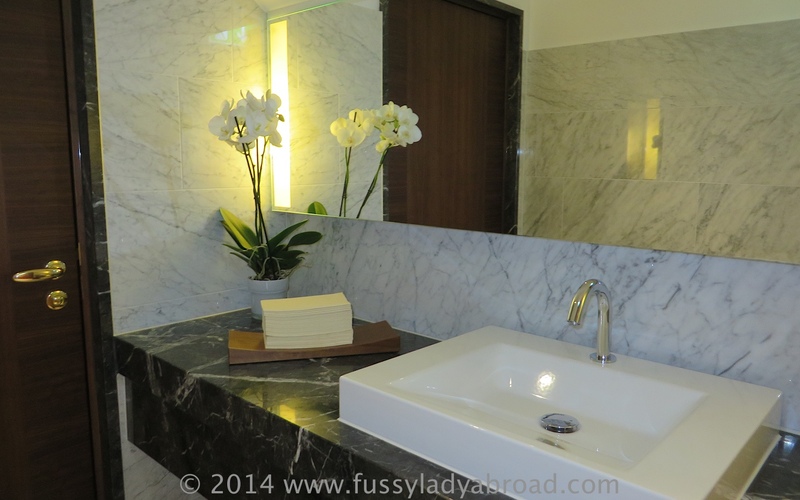 There is just a small ladies room for use by the roof top bar guests. It is clean and functional. The hand towels are a compromise: not paper, not cloth, but that non woven fibre that is most often used as disposable tablecloths. It dries hands, so I suppose that is all that really matters. The soap and hand cream are in glass dispensers, smell nice and leave your hands soft. FotoMarathonMan was first to go and check the facilities. He came back very flustered and muttering something about points to be deducted for poor signposting. When it was time for me to sneak off there with my camera, he challenged me to find it. I did find it in the end, and I must also say that I checked the sign on the way back and there is a sign just exactly where you would expect to see it at the bottom of the stairs, but I really only found it after wandering all round the 7th floor of the hotel looking for the ladies room. FotoMarathonMan was also less than impressed with the service. AkhalTekeGal enjoyed the cool breeze and the view. She was glad to be relaxing in relatively comfortable surroundings having spent the afternoon tending her Akhal Teke in the heat of the Austrian prairie. We discussed gin, and they resolved to try Yorkshire gin on their trip. 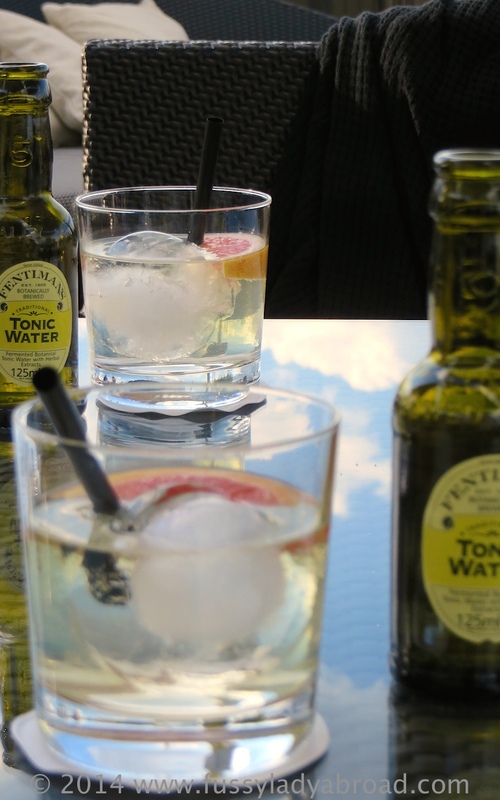 As for tonic, we wondered how Fentimans had managed to remain largely unheard of for more than a century before becoming one of the tonics of choice of Ginnoisseurs. We must to do more research on tonic waters. FotoMarathonMan and AkhalTekeGal are my tonic water “mules.” They are always kind enough to pop some slimline tonic into their car for me when driving back from their Yorkshire trip. It is not available here, so I am forever grateful to them for the supply. I keep the real stuff for special occasions and I bring back Soda Stream Slimline Tonic Concentrate in my suitcase for the Friday night 7pm Gintime ritual. We had a lovely time at Atmosphere, even if there were some small shortcomings, so overall, we’d give it 3.5 tumblers out of a possible 5. Now, although chandeliers, are more part of tea ambience, I thought you would like to see these modern ones that hang on the meeting room mezzanine floor at the Ritz Carlton. Chandeliers scream to me to check for lightbulbs that need changing. A friend in the facility management business told me they used to just change all the bulbs at a certain interval even if they were still working and he claimed that this was more efficient than checking and changing as needed. It saddens me to find those dark spots in those beautiful chandeliers. There was a small dark spot in this one. This entry was posted in Gin, Vienna and tagged Expat, gin, Rooftop, Vienna, Wien. Bookmark the permalink. I enjoyed your post about the tea there. I love all your afternoon teas. We had tea at the Ritz Carlton recently. I haven’t written it up yet, but there was drama and suspense, agony and ecstasy. Thanks for the comment.